» Free Credit Report » Guides » Credit scores and Borrowing Power: how are they different? Read moreCredit scores and Borrowing Power: how are they different? Credit scores and Borrowing Power: how are they different? You might have noticed there are two numbers on your TotallyMoney credit report: your credit score and your Borrowing Power. But what do they mean? And how are they different? Your credit score is a basic number that shows your credit file’s health, and how well you’ve managed credit in the past. It’s not affected by how much you earn or your savings. Borrowing Power relies on market activity, as well as your own financial behaviour. It gives you an up-to-date idea of the credit products available to you. 3. True or False? You only have one credit score. You have more than one credit score. Credit Reference Agencies (CRAs) calculate credit scores, and each agency does so differently. TransUnion is the CRA that calculates your TotallyMoney credit score. 4. True or False? You only have one Borrowing Power. You only have one Borrowing Power. TotallyMoney created Borrowing Power, which means you won’t find it anywhere else. 5. What can affect your credit score? Your credit score is affected by your financial behaviour, such as how well you’ve managed credit in the past, and whether you’ve paid on time. 6. What can affect your Borrowing Power? Your financial behaviour affects your Borrowing Power, as well as market conditions and lender criteria. Some lenders have tighter criteria than others. If this changes, your Borrowing Power might change, too. 7. 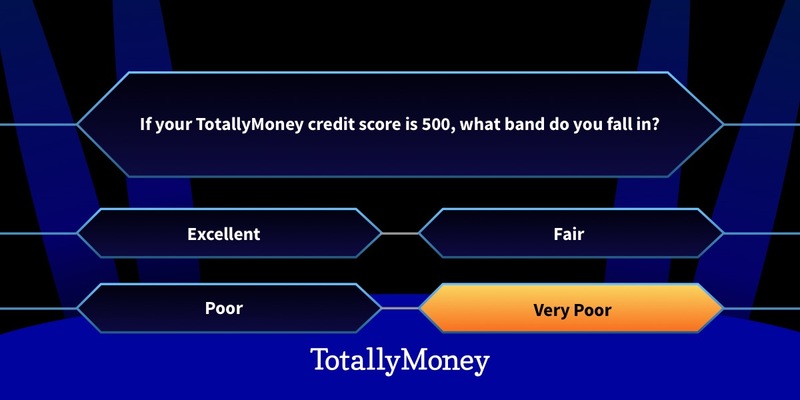 If your TotallyMoney credit score is 500, what band do you fall in? TotallyMoney credit scores are calculated by TransUnion and are out of 710. Any score below 550 falls into the Very Poor band. You need a score of 628 or more to fall into the Excellent band. 8. If your Borrowing Power is 7 out of 10, what band do you fall in? A Borrowing Power of 7 puts you into the Excellent category. You’re much more likely to have a wide range of credit products available to you at some of the best rates. 9. Why is it useful to check your credit score? Knowing your credit score helps you understand why it changes, and helps you take the right steps to improve it. 10. Why is it useful to check your Borrowing Power? If you need to borrow now, you’ll know what options are available by checking your Borrowing Power, and if you need to borrow later, you’ll know to take steps to improve it so you can get the very best offers. Whether you’re a credit beginner or a seasoned expert, knowing your credit score and Borrowing Power — and how they’re different — can help you take the right steps towards the life you want. Log in and now and see if there’s anything you can do to make them better. Now you know the differences between your credit score and Borrowing Power, log in now to see if you can make them better.